Alright ladies and gents! It is time for another great guest post. We have had so many awesome guests this month! It has really rocked! Today we have an extra special guest because she is one of my BFFs in real, normal, non-blogger life. My name is Allison and I am so excited to be over here on Blissful and Domestic today. Danielle asked me to introduce myself, and I was figuring out how to do that, because I don't have a craft blog (though I do love me some crafting!). 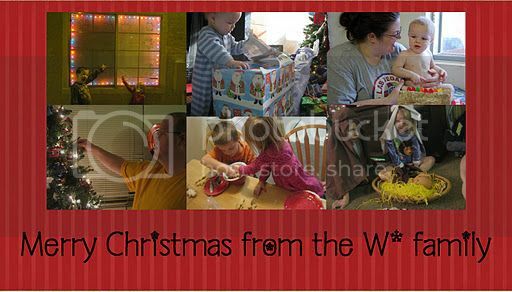 I have a family blog (the W* family) where I record the stories of our family: me, my husband, and our 3 children. 1) I've never been on an airplane. 2) I live in Las Vegas, and have never gambled. 3) I once put macaroni and cheese sauce on ice cream (it was a pregnancy craving). 4) I have a degree in Public Relations and hate public speaking with a passion. 5) I have permanent marker scribbled on my door, my kitchen walls, my living room walls, and on my couch. Because even though permanent markers are banned in this house, my husband has to use them for work, and usually ends up leaving one lying around for my 2-year-old to find. And I hope that it makes you feel a little better about your life... because I'm guessing that none of you have red permanent marker on your couch right now. We are huge on traditions in our family. I think traditions are sooo important in keeping a family close, and Christmas is a time for extra-special traditions. 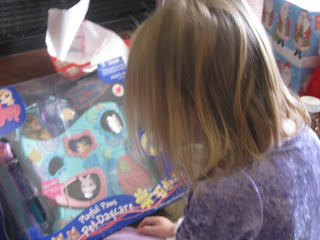 I love our Christmas morning traditions! We live about 5 hours away from any family, and my husband's job keeps us from leaving town at Christmas-time to visit them. So, we decided years ago that we needed a way to make Christmas special and our own. We are big on Santa in our house. I can't think of a better symbol of Christmas than Santa Claus; however, I don't want my children for a second to think that Santa is the reason we celebrate, either. 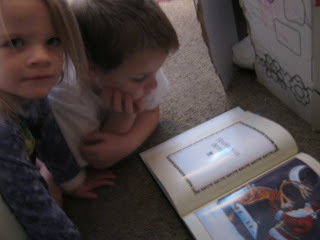 So, every Christmas morning (before any presents are opened from Santa), we read the book "I Believe in Santa Claus" by Diane Adamson. I love this book. It is all about how Santa is a symbol of Christmas, and when we see Santa, we should think of Christ. The illustrations are beautiful, it's simple for children to understand, and it's the perfect way for us to remember why we celebrate Christmas. ... and then things get a little crazy. Just before Santa leaves our home each year, he wraps our living room doorway in wrapping paper. 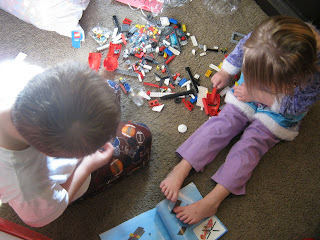 1) It keeps the kids from sneaking out to look at their presents. 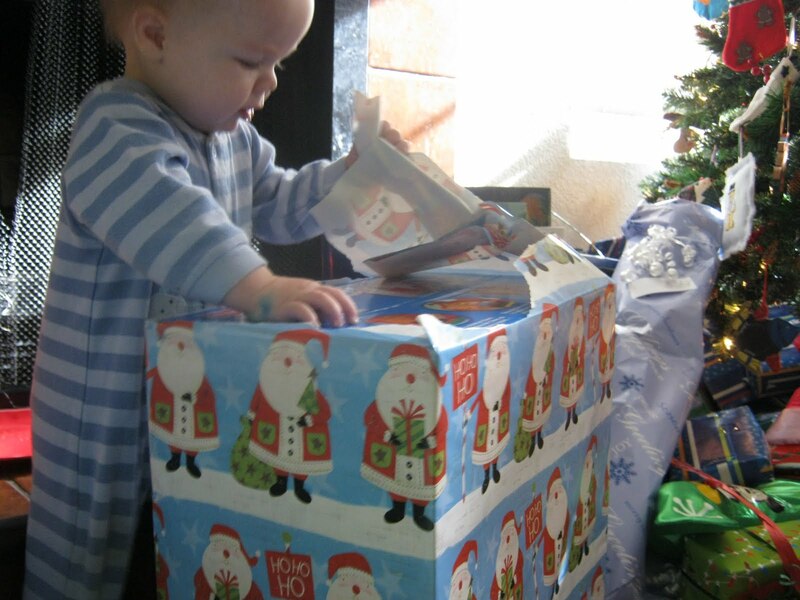 We love giving gifts and we like to see the happiness on their faces. 2) It keeps them focused for a few extra minutes on why we celebrate Christmas. If Santa didn't leave that wall up, it would be pretty hard to wrestle them to read a book and say prayers. 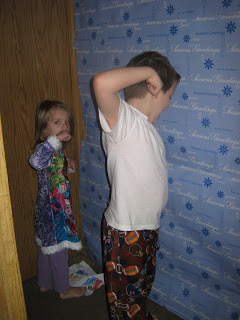 3) It's just fun to run through a wall of wrapping paper. ... and unwrap some more. In the midst of all that unwrapping and playing, we eat breakfast. We always have "Butterscotch Bubble Loaf" for breakfast on Christmas morning, just like my mom makes. It's like fancy "monkey bread." 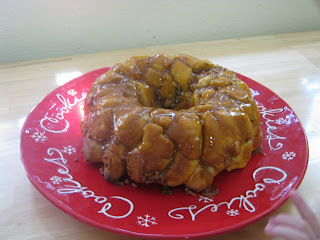 (If you've never had monkey bread before, though, that probably didn't explain anything). It's basically pre-made rolls (like Rhodes) with butterscotch pudding, brown sugar, and butter. You can't go wrong with a combination like that! I sneak out to to let the rolls thaw before we begin reading our book. After stockings are opened, we all head into the kitchen and help put breakfast together. While it bakes, we open the rest of the gifts from Santa. After gifts we eat it together at the table. Even though we all love this stuff (how could you not?) we only have it on Christmas morning, which makes it even more special. Thaw rolls until soft (about 2 hours at room temperature). Spray bundt pan. Cut dinner rolls in half and dip in dry pudding mix. Arrange rolls in pan, alternately arranging and sprinkling pecans. Sprinkle remaining pudding mix over the top. Combine brown sugar and butter. Heat together until butter is melted and a syrup is formed (microwave about 1 1/2 minutes). Pour syrup over rolls. Cover with sprayed plastic wrap. Let rise until double in size or even with top of bundt pan. Carefully remove wrap. Bake at 350°F for 30-35 minutes. Cover with foil the last 15 minutes of baking. Immediately after baking, loosen from sides of the pan with a knife and invert onto a serving plate. We spend the rest of the morning playing and napping, and enjoying that special Christmas feeling together. I hope that YOU make a Christmas morning tradition with your family this year! Thanks for having me, Danielle!